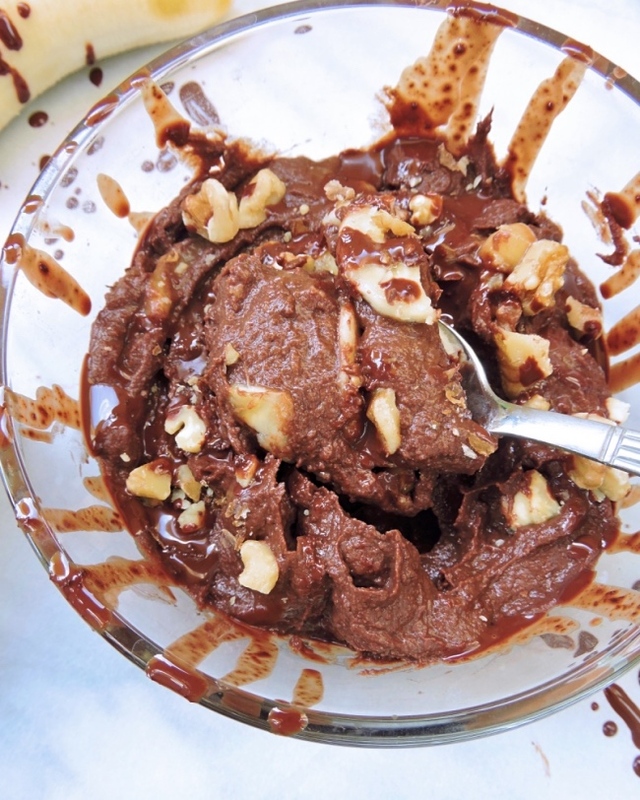 "Chunky Monkey"... What is it about that phrase that immediately gets my mouth watering? Must be all the delicious memories of that rich & decadent flavor combo of banana - fudge - walnut. And now I'm wondering, was it Ben & Jerry's famous ice cream flavor that started the chunky monkey craze? And everyone else jumped on board with loads of cookies, shakes, and brownies? Or vice versa? Don't know, and honestly doesn't matter - cuz this is one bandwagon that I have no shame in jumping on! My favorite part about the whole chunky monkey combo is that it's actually a pretty nutritious mix on its own (although not so much in the Ben & Jerry's ice cream). Bananas? Lots of potassium & fiber. Fudge (aka cacao)? Antioxidants, magnesium, calcium. Walnuts? Source of omega-3s. Combined with luscious coconut cream and just 2 (that's right just TWO) tablespoons of natural sweetener? Now this is a dessert I can seriously get behind. What makes this even better is that I've stirred in my Vital Proteins Grass-Fed Beef Gelatin. 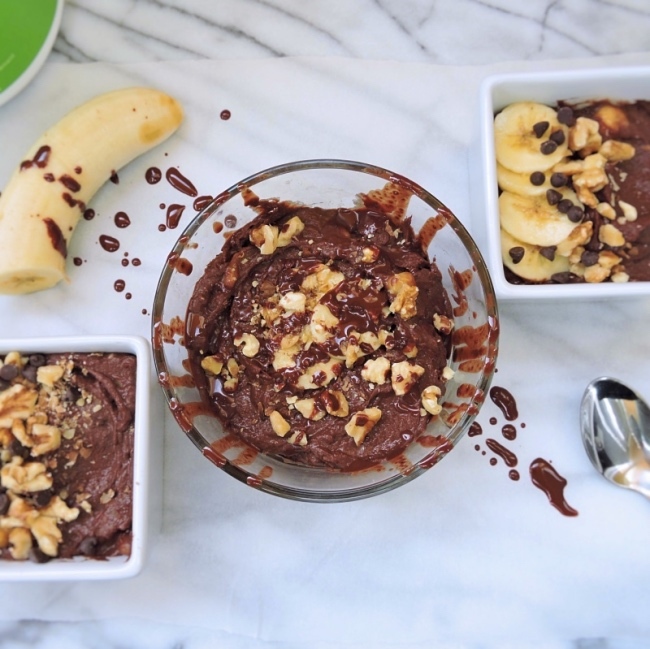 It's a flavorless powder that gives the pudding it's thickened consistency, while adding a solid dose of health benefits. Check out the Vital Proteins website here to read more, or grab a canister for yourself on Amazon.com! 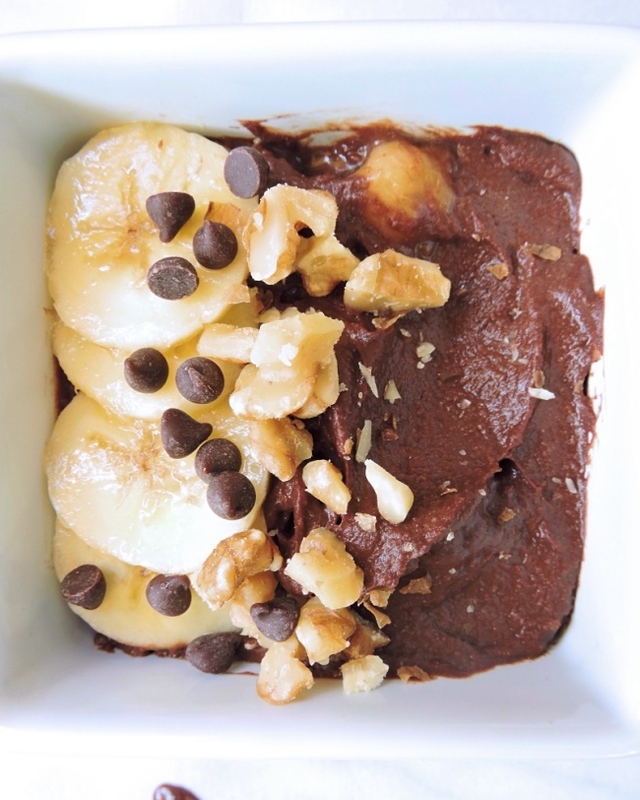 Of course this rich, yummy pudding is loaded with chocolate, and we know it has the hair/skin/nails/bones support from the gelatin, but it's also got the perfect amount of banana flavor. 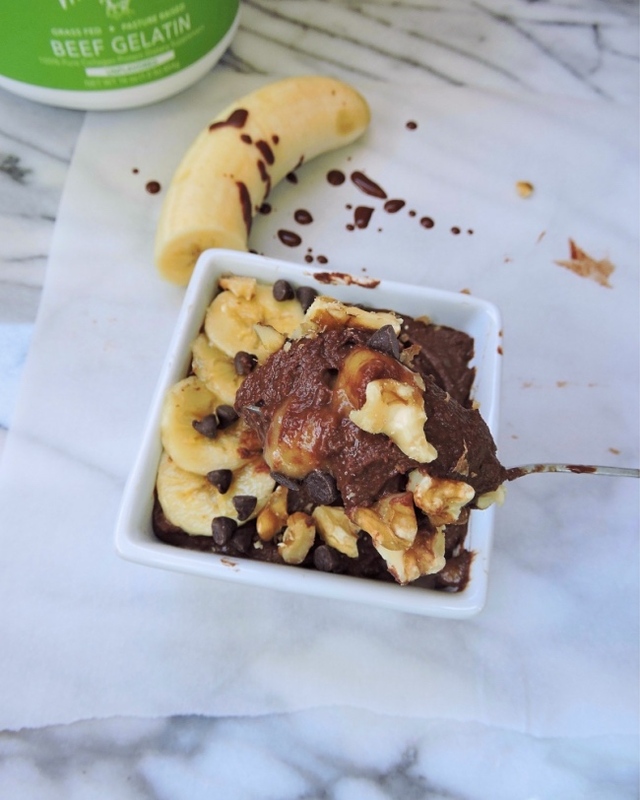 I use one banana and blend half into the pudding base as a natural sweetener, and chop the other half into chunks to be stirred in for a sweet, chunky bite! 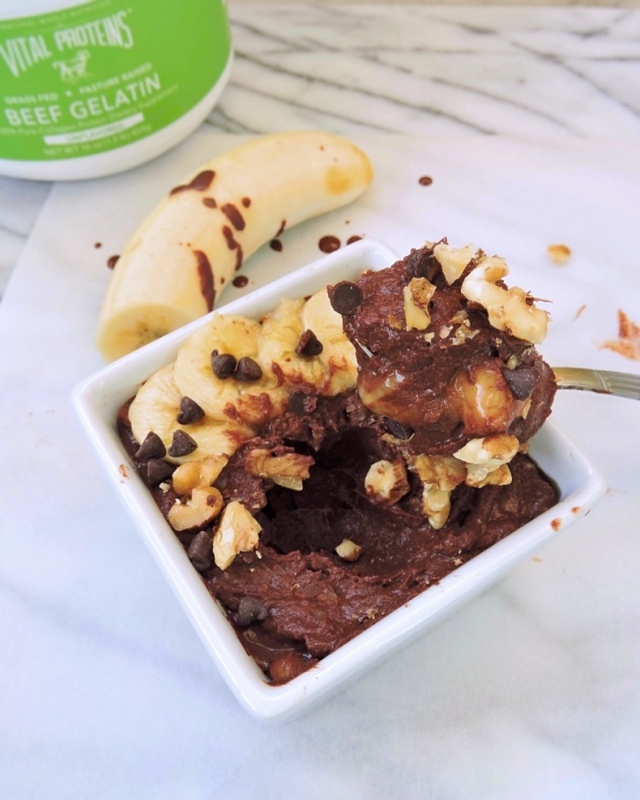 Get a bite (or 10) of this chunky monkey flavor fix without feeling like a chunky monkey (had to go there) with this creamy chocolate gelatin pudding. I know you will love it! In a small bowl, combine 2 tablespoons of the coconut cream with the gelatin and set aside. Slice a banana in half: saving one half of it for blending, and chopping the other half into small pieces. To a blender or food processor, add the remaining coconut cream, maple syrup or honey, vanilla, sea salt, and 1/2 of the banana. Pulse until smooth. Transfer the smooth mixture to a medium saucepan over medium heat, and stir in the cocoa powder. Bring the mixture to a low boil, then remove it from the heat. Whisk in the gelatin mixture. Let it cool to room temperature, then stir in the chopped banana, chopped walnuts, and chocolate chips. Cover the bowl and transfer to the fridge, chilling until thick and creamy. Give it a stir every 30 minutes or so to keep it smooth without a "skin" forming on top. 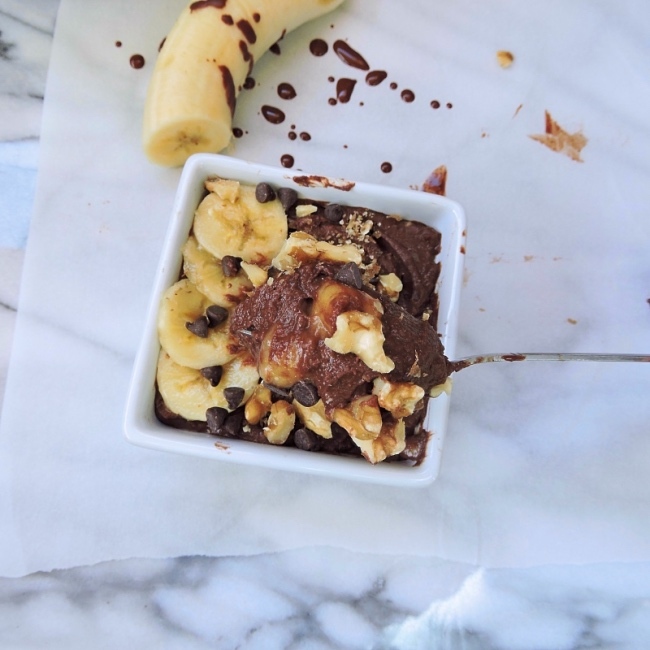 Top with extra banana, walnuts, and chocolate chips if you're feeling fancy. Serve chilled, sitting out at room temperature for a few minutes to soften if you'd like. Enjoy! We found our coconut cream at Trader Joe's. Substitute full-fat coconut milk if that's what you have, and increase the gelatin by 1/2 tsp. This post is sponsored by Vital Proteins. Shout out to them for working with me to make this Chunky Monkey goodness a reality! And big thanks to all of you for supporting just Jessie B.! This looks so sweet and tasty! I like to try new food and then write my essays about my feelings. I think this is great experience and it's expression. This looks wonderful, and I want to make it for a small family dinner (6 guests), but I could not find how many servings the recipe makes. Could you help me with that? Thanks!